Suit Up Hot Dogs, You’re Going to a Party! 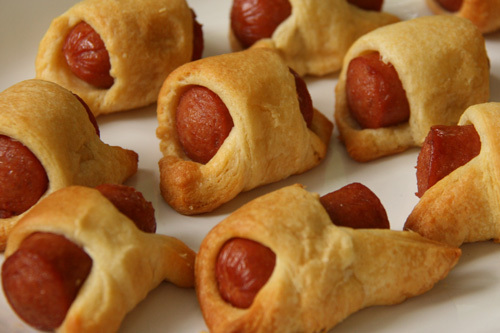 Why on earth does anyone in their right mind give you a “recipe” for hot dog crescent roll-ups on their very prestigious, prissy little baking blog (Don’t worry, I have no delusions of grandeur…but one can dream can’t they)? Pop and Fresh anything isn’t exactly on the hot list and neither are hot dogs for that matter. Today, my recipes have taken a back seat to the words it seems. 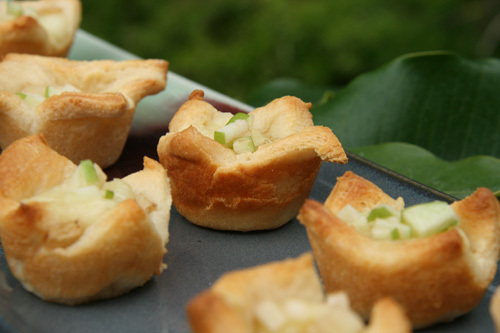 At least I have also included a recipe for Brie tartlets with Granny Smith chutney that are melt-in-your mouth delicious. They were served to rave reviews and were so creamy and sweetly tart that they literally crept into my dreams last night, and I woke up wishing I had saved a couple in the fridge…so this post will not entirely disappoint you (I hope). You see…yesterday was my son’s homecoming dance. One amazing mom (We’ll call her Laurie) had invited their whole group of friends to her home for an elegant sit- down dinner for twelve, and parents were encouraged to play the part of the paparazzi. As I looked around the room of gorgeous, silky dresses and crisp, dark suits, the kids almost looked like strangers to me, yet I have known most of the boys for at least ten years. “Why do those darned suits have to make them look so much like grown men?! ” I thought. I kept tearing up, but luckily, the crowd was buzzing, and I believe my tears went unnoticed. Their arms awkwardly dusted the backs of their dates’ dresses, as they politely took the passed Hors d’œuvres and tried to make small talk. They stood painfully in stiff and shiny dress shoes while their dates posed gracefully in heels. Where are the Legos, torn hole-in-the-knee jeans, and where’s the dab of jelly on their face? The innocent little boys are gone and in their place are almost grown-ups. They’re towering over me. Their boyish hugs feel like a man’s hug. Their skin is smooth and anew because they are freshly shaven…not because they are young and little. Eyes are lit up and sparkling because of the room full of pretty girls, not Christmas presents under a tree. Yet, in this room of men, my “fancy” hot dog crescent roll-up appetizers are the first to go…not the brie tartlets with apples. One of the guys tells me the hot dog appetizers are “awesome!” I smile, not because of the compliment, but because somewhere on the inside they are still boys who prefer hot dogs over brie. Although, I think the time has long gone for preferring holiday gifts over beautiful girls. As I help the hostess deliver plates and fill water glasses, I get to be a fly on the wall as they casually make conversation. What a coup. It’s a mom’s dream to get to spy on a beautiful evening such as this; watching animated gestures, hearing laughter and feeling the buzz in the room in anticipation of the dance. Nights like this, although taking a jab at the heart, are simply perfect. I have to remember to grab on to them and hold on tight because most of the stuff in between is not quite as smooth sailing with teens. Tonight there are no pleas to do homework, no crow bars necessary to peel them off the computer keyboard, and right at that moment they are safe and sound in the home of a friend. 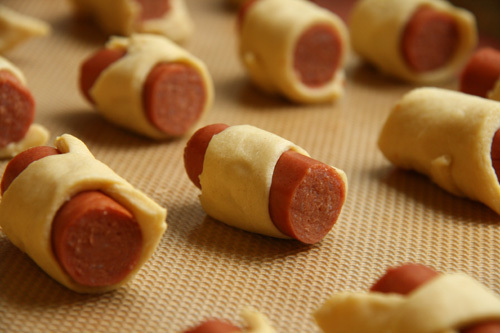 I really couldn’t get myself to give you a recipe for hot dog roll-ups in crescent roll dough so here is the link to the Pillsbury site if you feel the need for instructions. But the Brie tartlets, that’s another story. I felt I must share that little number with you because they will be a new fave over here despite needing to use dough that magically pops out of a can. Feel free to substitute a lovely homemade pastry dough or purchased puff pastry dough instead. As for me, I am going to keep it just like it is because I hate to mess with perfection and truthfully, it was cool to have an appetizer I could whip up quickly that was so simple but delicious. Makes about 30 mini tarts. There’s about 10 minutes of prep time and 12 minutes of baking time so this is a fast and easy appetizer! Preheat your oven to 350 degrees and get out two mini-muffin tins. No need for greasing the pans. Peel one apple and dice finely. See above photo. Pop the dough out of the tube (thought I would NEVER say that on this blog), and lay the sheets of dough flat on a pastry or cutting board, long side going across the board from left to right. Cut five rectangles vertically on the long side of the dough. Then cut across into thirds, making 15 squares. Each square should be about 1.5×1.5 inches. Push each square of dough gently into the ungreased muffin tin cups. Melt the butter in a small sauce pan over medium heat, and add the diced apples. Sprinkle the nutmeg and ginger into the pan and add the honey. Saute for about three minutes or until the apples are slightly tender but NOT MUSHY. 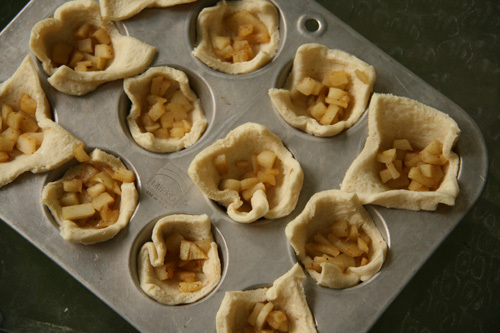 Place them in a small bowl to cool slightly before assembling your puffs. Trim the rind from the brie, and cut the brie into tiny squares, about a 1/4 square inch. Assemble the puffs by putting about a teaspon of the chutney into each pastry and top it with a square of brie. Bake for 10-12 minutes, keeping an eye on them. You want them to turn a nice golden color, but they can go form almost done to slightly overdone rather quickly. Cool them for just a few minutes and carefully lift them out of the pan. If they are sticking, use a butter knife to gently loosen them up around the edges, and then they literally pop right out. While they are baking, dice 1/2 of the Granny Smith apple that has the peel ON extremely finely. You will use this to garnish the tartlets. If you choose to add the walnuts, toast the them first on top of the stove in a small saute pan on medium-high heat pushing them around in the pan often to avoid them burning. Toast them for just a minute or two. They burn easily. 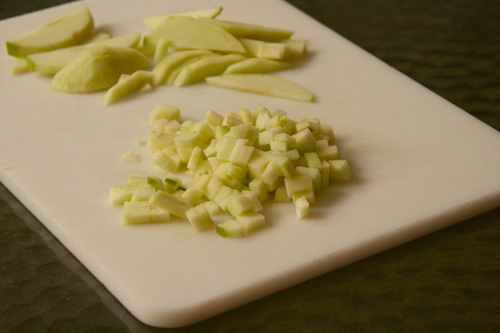 Then chop them finely like the Granny Smith garnish. After the tarts have cooled for just a couple of minutes, garnish with a pinch of the diced fresh apples and chopped toasted walnuts. Try to bring them to the party before eating half a tray. It’s not easy. Categories: Appetizers | Tags: brie and apple appetizers, homecoming, hot dog crescent appetizers, teenagers growing up | Permalink. This made tear up just reading it. So beautifully written! And you don’t even know these boys! 🙂 I guess moms are moms…we get kind of emotional over this growing up stuff. This is a wonderul looking hotdogs! great recipe. Thanks for posting this. Your picutres are amazing. Beautifully written. . . really enjoyed the post and will give the recipe a try. I love finger food, and both are so cute and easy to eat…lovely idea 🙂 Great photos! Thanks…sometimes you just get really lucky. Well you are very sophisticated Linds. Aww . . . I dont even have kids and this post totally tugged at my heart! 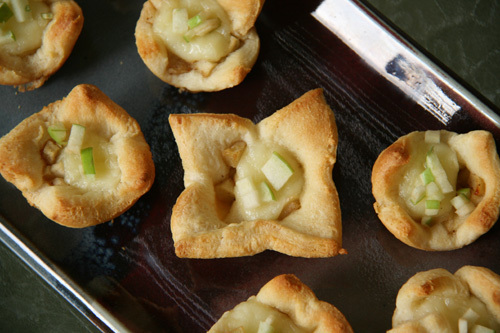 The Brie-apple tarts sound terrific… I’ll keep them in mind for future dinner parties! And what a lovely post – I love your description of the kids before the dance. So cute.